Hillary Clinton visited Seattle’s Rainier Beach High School last week, a moment of pride for the school and neighborhood. But some community members care more about sustained attention from local leaders. 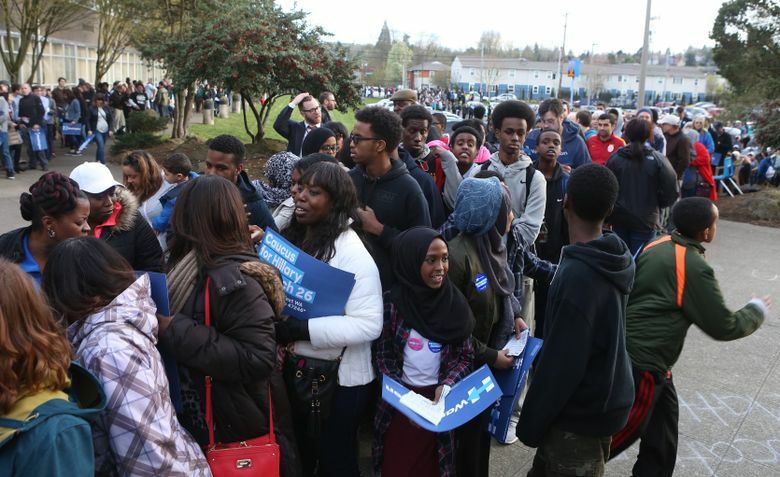 Seattle’s Rainier Beach neighborhood and Rainier Beach High School had a lot to be proud of last week, with Hillary Clinton holding a rally at the school Tuesday. The Democratic presidential candidate began a speech that made national headlines by praising the school’s academic turnaround and boys’ basketball team. “I like how she’s showing the neighborhood love,” Qiana Redd, 35, who went to the high school and still lives nearby, remarked while standing in line for the event. Clinton was soon gone, however, on to the next stop on her cross-country campaign — and what some members of the Rainier Beach community crave more than the spotlight is sustained attention on their problems and support from local leaders. Seattle Mayor Ed Murray, who introduced and endorsed Clinton at the rally, suggested Rainier Beach after her campaign asked for a high-school venue, he said. The neighborhood is diverse, Murray said, noting Clinton has done well with voters of color. The school, he added, is a success story, having improved its graduation rates and test scores since adopting the International Baccalaureate (IB) curriculum. Murray wants to plan a better future for the neighborhood, where jobless and crime rates remain challenges despite recent capital investments by the city, he said. Most days in Rainier Beach aren’t like Tuesday, however. The school’s IB program is on track to run out of dedicated funding, according to an administrator. Neighborhood planning by community members in 2014 has yet to be realized, according to an activist. Gunfire at the Rainier Beach light-rail station Thursday put the school on a shooting-related lockdown for the second time in two weeks. “The concern is that politicians come here and have our kids in a photo-op — and then what,” said Colin Pierce, a teacher at the school and its IB coordinator. Officials agree the IB program should continue; Murray hired Beach’s principal last year to run his education department. But Seattle Public Schools has yet to identify future funding and talks with state lawmakers have yet to yield results, Pierce said. Tammy Morales, a community activist who lives in nearby Seward Park but worked on Rainier Beach’s neighborhood-plan update, said Murray should visit the area more. The update calls for development near the light-rail station to focus on food-related businesses, jobs and education. Morales said progress on that front has stalled. “There was a lot of work on the community’s vision for making this an economically viable part of town, but nobody seems to be pushing that forward,” she said. Abshir, the Beach senior, said she was disappointed Clinton didn’t address certain problems she sees in the community, like unreliable electricity and heating in her school, mistrust of Seattle police and students being sent to jail for missing class. Not everyone was expecting much from Clinton’s visit. Mimi Hunter, who started a foundation last year to raise money for her alma mater, said the community can’t count on politicians to make change in Rainier Beach.